Creating content is important when growing your business online. But if you’re not converting prospects into leads, your marketing is going to fall flat. If you’ve been producing great content, but haven’t been seeing great results, you may need to look to your opt-in page for answers. An opt-in page is a place, usually a website page, where you ask prospects to take the relationship to the next level. Offer them a really valuable piece of content in exchange for their email address & name. Once you have their information, you can send marketing materials directly to them. But all this marketing magic starts with an effective opt-in page. 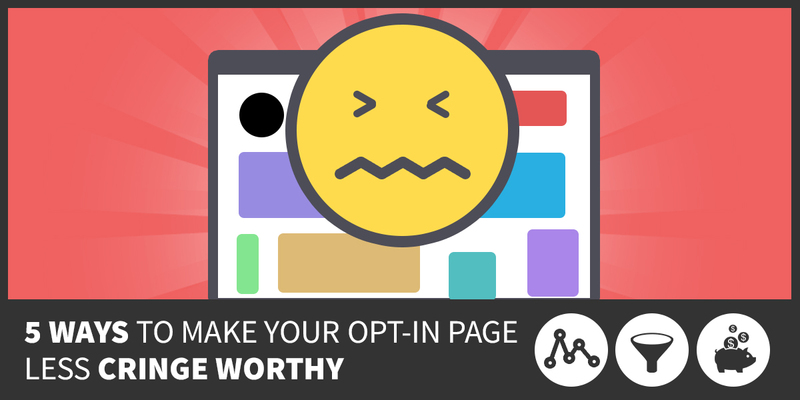 If your opt-in page is stuck in a perpetual state of meh, follow these 5 tips to make it marvelous. Have you ever gone to a website to buy something just to be shot down by a busted shopping cart? If so, you likely didn’t spend 45 minutes trying to troubleshoot the page. Most customers would try once, then go to the next best choice in Google, and buy something there. The great thing about online order fulfillment is that it can work 24 hours a day. But for it to do so, you need to make sure it’s working through testing and maintenance. People are very protective of their name and email address. So it’s not always easy to convince them to give it up for your content. Center your opt-in around an intriguing promise. Whether it’s a video, text or even an image, create one message that prospects can get behind. And the more emotional the message, the more likely you’ll get prospects to opt-in. Even though a powerful message is important, don’t get too carried away. Describing a content offer in 5 long paragraphs is going to lose prospects. Instead, figure out how you can explain your offer in the quickest, most straight-forward way possible. Focus your energy on jazzing up the headline, bullet points and maybe a short paragraph with concise solution focused language. Nobody wants to be a guinea pig online. There’s always the fear of getting ripped off or downloading a virus. But you can take away (or at least reduce) that fear by providing prospects with social proof. Social proof refers to showing that others have done it and have had a positive experience, which will help ease the prospect’s mind. A few of the most common forms of social proof are reviews, comments and Facebook likes. By collecting this information you can not only provide social proof, but also see what customers are saying about your brand. All copy and content on an opt-in page should be utterly exciting. But many times the submit button gets overlooked and is stuck saying something like “go”. That’s about as exciting as wet carpet samples. Creating a successful opt-in page can be a tiny bit tricky. Expect to go through a little trial and error with copy, content and graphics. But once you find that perfect equation, an opt-in page takes care of itself. Just remember to keep your messaging clear, concise and exciting. Want to learn how to create a better content marketing system? Check out our free ebook The Small Business Lifeline: Sales and Marketing Automation, to learn how you can market your business while brushing your teeth.